In the book What to Expect When You’re Expecting, they say 23 weeks is 6 months. 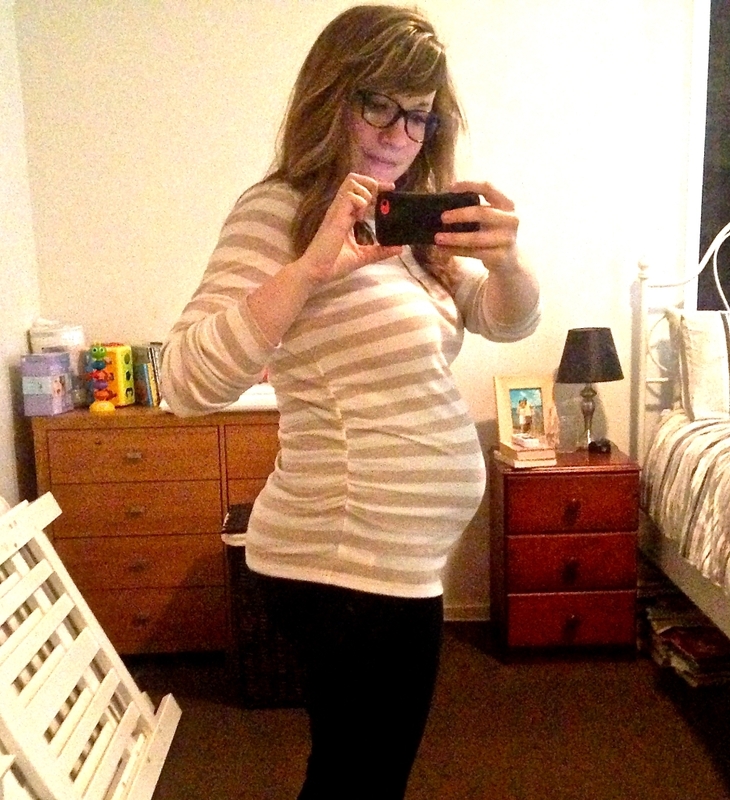 It’s very weird to me to say that I am “6 months pregnant”. How did that happen? I am amazed that we are already halfway through March. There’s a lot happening in this second half of March that I am looking forward to – it’s quite a bit busier than the first half. I am also thankful for the weather calming down. It helps in so many ways. I don’t get swollen. I have more clothes to wear since I got some maternity stuff in the States in December when it was winter. I sleep better. It’s just so much better. Food Cravings: Burgers (thanks Grill’d for the help with that one last week), cold cereal, cold oranges, sparkling water. On Thursday I had my first bout of indigestion. I was already feeling a little weird prior to dinner, and then we went and ate a burger. That’s all I had, too – a nice burger. However, after we ate and walked around a bit, indigestion hit and was no fun. Robbie told me to walk with my hands above my head, and even though I looked completely ridiculous, I did it because it helped quite a bit. I came home and laid on the couch, and it seemed to subside after a while. Swollen feet and hands. This isn’t a continuous one for me yet, but it happened a couple times this week when the weather was really hot. On Thursday, I had such a hard time getting my wedding rings off. That made me nervous, so now I am just wearing my band. I figure it’s better for that to get stuck than the other one. The swollen feet go away if I put them up, though, so it’s not too big a deal. New this week: I had a Dr. appointment on Tuesday. I always enjoy that because I get to hear the heartbeat and find out how everything is going. I was measuring at exactly 22 weeks, which is always nice to hear. The heartbeat was pretty cool, too, because it seemed to be in sync with my heartbeat this time – it was a nice layered beat/rhythm. I was going to record it at the recommendation of one of my friends, but I totally spaced. I also got signed up for my glucose test, which is tomorrow. I don’t feel like I should be worried, but any test seems weird to me. Hopefully everything goes great and the drink isn’t as bad as I’ve heard. :) When I called to make the appointment, they asked me where I lived and then recommended I go to a place closer. I was very happy to do this because I figured I’d have a better chance of convincing Robbie to go with me as this hospital has some of his favourite coffee. It’s so random – a hospital with great coffee? All goes back to a story from 2010 I think when his roommate had to go to the hospital to get checked out. Robbie tried the coffee, and it changed his life apparently. Such a silly story, but hopefully it’ll work to my advantage so I don’t get bored waiting there for 2 hours! Looking forward to: I am looking forward to having that test out of the way :) I am also looking forward to our trip in a few weeks for Robbie’s sister’s wedding. And, we start our birth and parenting classes next week, which should be hilarious and hopefully informative. Miss anything? Sleeping on my stomach and sushi. Exercise: I’m just gonna be honest – I haven’t really gotten “there” with exercise. It seems the weeks are just flying by, and exercise (whether pregnant or not) is one of those catch-22’s — you’re too tired but you know it’ll actually give you energy. I very much want to get this into place, and I don’t want to fall into a trap of thinking that it’s “too late”. I’ve been reading the foundation chapters of the pilates for pregnancy book, though, and it’s actually quite inspiring and helping me to understand the way my body works and what will help with the birth. My goal is to walk 30 minutes a day and do Pilates a few times a week – we’ll see how we do with that over this next week!